A group of 8 recorders gathered in the lochside car park at Beecraigs Reservoir on an April evening for the first TWIC outing of the season. The outing was a joint meeting with the Lothian Amphibian and Reptile Group (LARG). 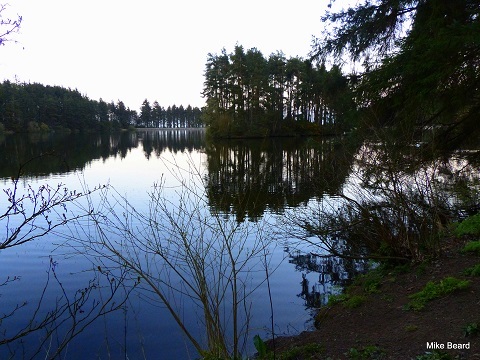 Beecraigs Reservoir lies within a mature conifer plantation that forms part of Beecraigs Country Park and is owned and managed by West Lothian Council. Records for the water body itself were scant, so the outing was arranged to generate amphibian records for the site prior to its assessment as a Local Biodiversity Site. Beecraigs Loch near Linlithgow, West Lothian. Photograph courtesy of Mike Beard. Common Toad, pair in amplexus (mating position, in which the male clasps to the back of the female). Note the smaller size of the male. Photograph courtesy of LARG. After an initial briefing by our leader, Gary Hovell, we set out to the site. The plan was to do a visual torchlight survey of the loch for newts followed by netting. It was decided during the site recee that bottle-trapping was not appropriate at this location. While we waited for sunset, we took the opportunity to view some of the other wildlife species on site and noted wildfowl using the reservoir such as Mute Swan, Tufted Duck, Greylag Goose and Mallard. Our first amphibian 'tick' of the evening was for Common Toad. 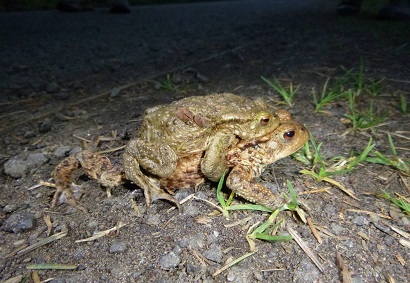 We found a pair in amplexus on the path. The smaller male was clinging to the back of the female, effectively hitching a lift to their breeding site. Further on, we spotted frogspawn in the loch and counted 5 clumps. Counting clumps of frogspawn can provide an estimate of the number of adult females in the population. This is generally easiest when the spawn is freshly laid and has not yet merged into a single mass. But it is still possible to estimate numbers of spawn from the area the spawn covers. The light levels were dropping rapidly as we approached the far end of the reservoir. It was then we started to see bats flying across the water body and above our heads. John, one of the Scottish Wildlife Trust Developing Ecological Surveying Skills (DESS) trainees, had the foresight to bring his bat detector with him. He was therefore able to identify two species using the loch, Common Pipistrelle 45kHz and Soprano Pipistrelle 55kHz - a welcome addition to the species records for the site. Once the sun had set, we started our exploration of the water body from the reservoir banks. Scanning the water with the high powered torch light we quickly picked up further Common Toads as well as Common Frogs and numerous fish, but newts eluded us. Natalie, TWIC's Ecologist, was pleased to find a Leopard Slug (Limax maximus) in the woodland en route. TWIC are currently running a postcard survey to try to generate data for this species. It is a native slug, presumably widespread, but currently under-recorded. As it has distinctive markings, anyone should be able to identify this species with practice. For further information, including an online recording form, visit the Spots and Stripes survey page. As we approached the far eastern end of the reservoir and the conclusion of our survey, we decided to explore a rocky area and finally picked up a newt in the water! On closer inspection we found it was a female. A juvenile was also seen. Both were difficult to identify reliably through the murky water, so we tried to catch them in a net in order to confirm the identification. Unfortunately the newts had other ideas and quickly disappeared. We were therefore only able to record "newt" (Smooth / Palmate) for the site. However, we were pleased to have confirmed the presence of newts at the site. Using high powered torches after dusk can be an effective way to search for amphibians. Photograph courtesy of Mike Beard. Thanks to Gary Hovell, LARG secretary, for leading an enjoyable evening's outing. For further information on LARG visit their website, like them on Facebook or follow them on Twitter. Recording along the Union Canal near Hermiston. Photograph copyright Mike Beard. A 5 km stretch of the Union Canal from Ratho to Hermiston (Vice County Midlothian 83) was surveyed during two TWIC recording excursions this summer led by Katherine White. The main focus of both outings was to update the botanical records prior to the sites assessment as a Local Biodiversity Site. 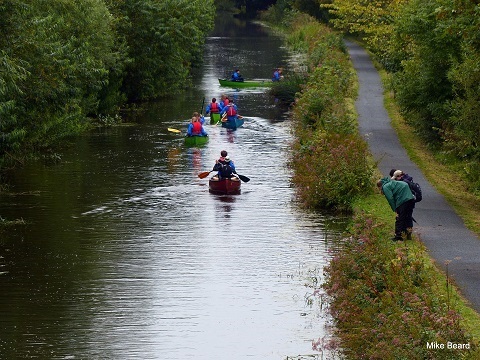 A group of 9 people assembled just north of the canal bridge in Ratho on Sunday 6th July to survey the initial 2.5 km of the canal from Ratho to Addiston Mains. The weather forecast suggested the potential requirement for waterproofs, but the group were treated to spells of sunshine with only a passing heavy shower in the middle of the day. The majority of the edge of the canal was thick with the tall Reed Sweet-grass (Glyceria maxima) growing alongside a range of common flowering plants including Great Willowherb (Epilobium hirsutum), Meadowsweet (Filipendula ulmaria), Meadow Vetchling (Lathyrus pratensis), Greater Bird's-foot-trefoil (Lotus pedunculatus) and Tufted Vetch (Vicia cracca). Arrowhead (Sagittaria sagittifolia). Photograph copyright Mike Beard. The habitat along the canal varied throughout the 2.5km. There were disturbed areas adjacent to the recent building works in Ratho, providing species of interest such as Field Pansy (Viola arvensis) and Common Ramping-fumitory (Fumaria muralis). There were also open areas further along the canal where the group found a Common Spotted-orchid (Dactylorhiza fuchsia), patches of Zigzag Clover (Trifolium medium) in flower and frequent Yellow Oat-grass (Trisetum flavescens). In the sheltered wooded areas it was good to see Wood Meadow Grass (Poa nemoralis), Hairy-brome (Bromopsis ramosa), Wood Millet (Milium effusum), Remote Sedge (Carex remota) and Lady-fern (Athyrium filix-femina). One of the excursions target species, Water-plantain (Alisma plantago-aquatica), was successfully recorded in a few locations and Arrowhead (Sagittaria sagittifolia) was a new record for everyone attending the excursion. On Sunday 10th August, the second recording excursion was attended by a group of 4 people which covered the 2.5 km of the canal from Hermiston to Addiston Mains. 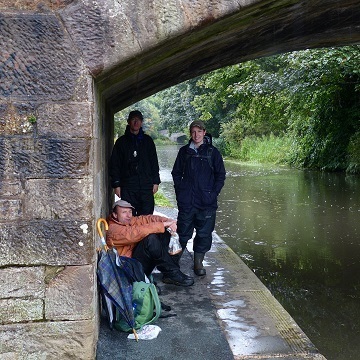 The weather predictions of persistent rain were unfortunately correct and the group experienced downpours for most of the day, with a brief respite sheltering under a bridge for lunch. Undeterred by the poor weather conditions the group had a productive and enjoyable day recording with some interesting botanical finds. A bridge provided a welcome break from the rain! Photograph copyright Mike Beard. It had been one month since the first excursion to the Union canal and the seasonal progression of the plants was evident, with many species in seed. However, there were a number of late flowering species still providing colour along the canal path. These included; Common Knapweed (Centaurea nigra), Common Valerian (Valeriana officinalis), Marsh Woundwort (Stachys palustris), Tufted Vetch (Vicia cracca), Wild Angelica (Angelica sylvestris), Sneezewort (Achillea ptarmica) and the surprise of the day, the Welted Thistle (Carduus crispus). Welted Thistle (Carduus crispus) was a surprise find on the second outing. 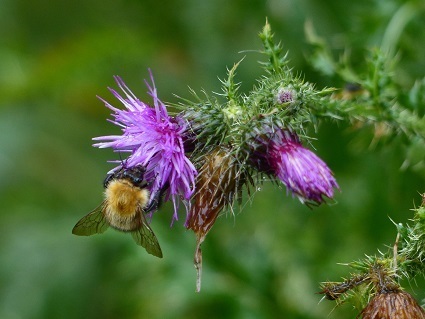 Here, a Common carder bee (Bombus pascuorum) is seen extracting nectar from the thistle flowers. Photograph copyright Mike Beard. 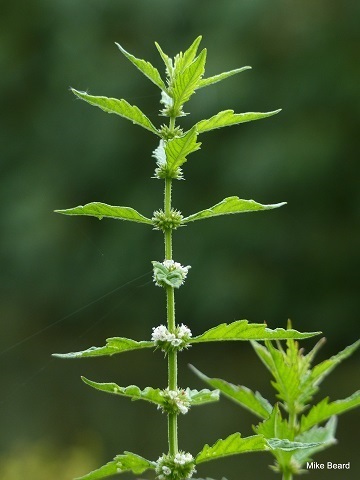 Two of the excursions target species, Water-plantain (Alisma plantago-aquatica) and Gypsywort (Lycopus europaeus), were successfully recorded in several locations throughout the day and both were observed in flower. 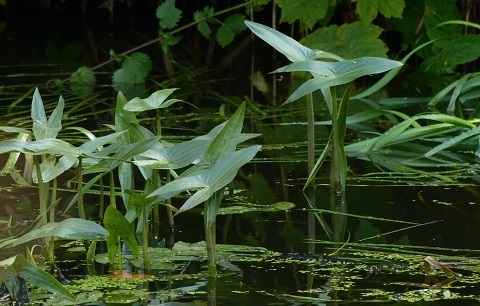 Some additional species of interest in the water included Ivy-leaved Duckweed (Lemna trisulca), Common Club-rush (Schoenoplectus lacustris) and Arrowhead (Sagittaria sagittifolia). The latter species was recorded once during the first excursion in July, but was frequent throughout the length of this section of the canal. 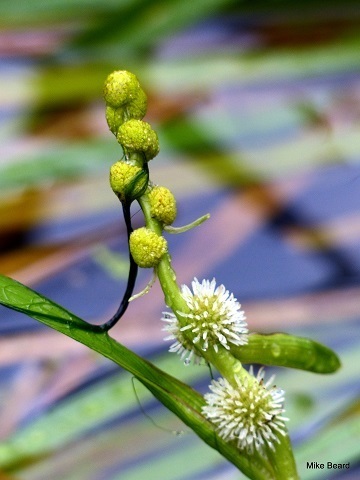 It was also of interest to record both the Unbranched Bur-reed (Sparganium emersum) and the Branched Bur-reed (Sparganium erectum) in flower and observe them growing next to each other for comparison. Gypsywort, Lycopus europaeus (left) and Unbranched Bur-reed, Sparganium emersum (right) are locally rare species, being found in less than 2% of Lothian 1km squares. Photographs both copyright Mike Beard. Thank you to TWIC and everyone who attended both excursions. In total, over 200 plant species were recorded for this 5km section of the canal. Editor footnote: Although the focus of the outings was botany, the group did record other taxa during the two visits, including 20 species of bird, insects (including 11 hoverflies) as well as a few lichens, bryophytes, fungi and molluscs. The photograph below shows the hoverfly, Riponnensia splendens, identified by Colin Legg during the first outing. 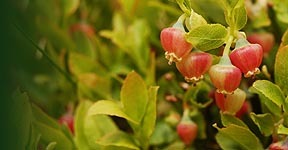 This species is widespread and common in the lowlands of the southern half of the British Isles, but becomes scarcer to the north - perhaps partly owing to under-recording. Adults are active between May and October and can be found on vegetation close to water or on trees and bushes (Ball and Morris, 2000). For distribution information, see the Hoverfly Recording Scheme website. 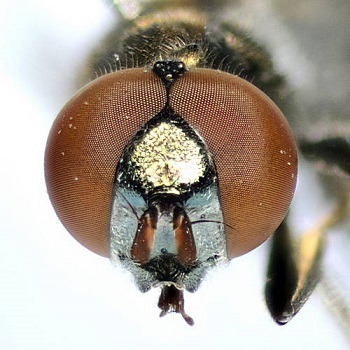 Face of the hoverfly, Riponnensia splendens. Photograph copyright Colin Legg.